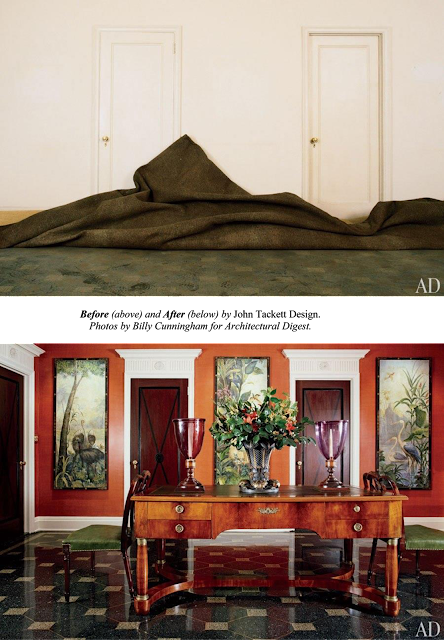 One of the most talked about features of Architectural Digest magazine is their annual "Before & After" issue. Some of the articles in these past issues have been real "eye-rollers" with the only difference, it would seem, in the photos being that one photo was taken before furniture -- perhaps with a large cardboard box and a ladder as props -- and the other photo taken after the furniture had been installed. Other projects were truly interesting transformations, however, showing great design insight and inspirational style. In the November, 2013 issue, Mitchell Owens takes a look back at ten of the best in the article "Second Chances." (Click the title for the on-line version of the article). While it is no secret that I praise Mitch as one of today's best design writers, when I saw that title I thought to myself that he would be crazy if he had overlooked my architectural project decorated by Bunny Williams that had appeared in the February, 1994, issue. (If you do not recall it being featured on The Devoted Classicist blog last May, take a look here). Well, Mitch had not lost his senses, of course, and did indeed choose the Park Avenue apartment renovation for his article. (I know he does not write the captions, so I will forgive omitting my name which was included in the original article). The Entrance Hall image with those incredible painted panels commissioned especially for the space and the restored terrazzo floor is one that has received so much praise over the years that I appreciate it, of course. But it was the exceptionally large Dining Room that really had the biggest transformation into a Library that was the show-stopper for visitors to the apartment. (Since the clients only used the apartment as a pied-a-terre and always went out for dinner when in Manhattan, there was no need for a formal Dining Room). In any case, it was a real treat to see these pictures in print again. Many of my clients read Architectural Digest, so I appreciate having my work included. Before photo by Glenn Keyes Architects. After photo by Steven Brooke. All photos are from the Conde Nast Archive. 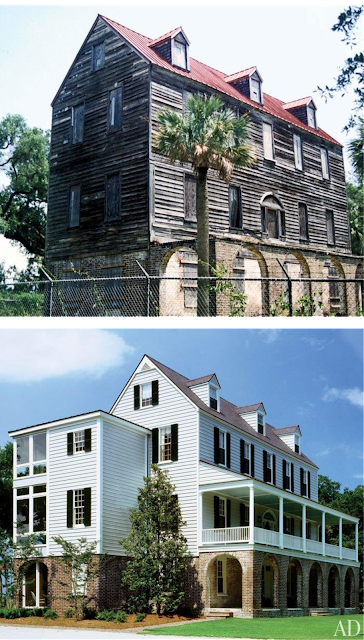 Another project included in the article was the restoration of an 1803 plantation house on Kiawah Island, South Carolina, by my friend and former architecture school classmate, Glenn Keyes. In a team associated with architect Chris Schmitt, the piazza was reconstructed and modern conveniences were provided in additions that allowed the existing rooms to be restored to their original form. Take a look at this and other Architectural Digest articles and blog posts by Mitchell Owens here. as it appeared in 2013. The most popular of all the posts of The Devoted Classicist is a selection of fabulous New York City private residences titled Landmark Manhattan Townhouses For Sale. 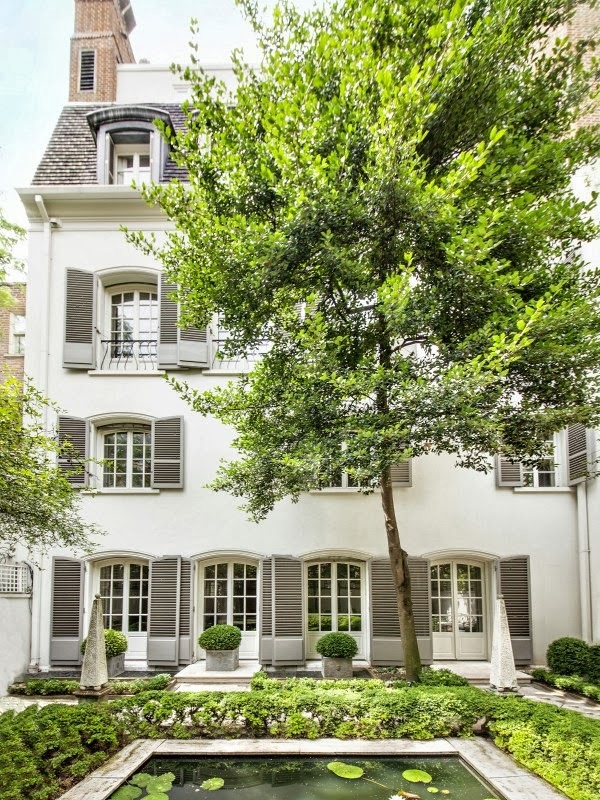 This post is a sequel, one might say, presenting one of the most remarkable townhouses for sale, highly suitable for anyone wanting "a little place in the city." Long one of this writer's favorite townhouses, 125 East 70th Street, is the dream home for the most discerning traditionalist city dweller. 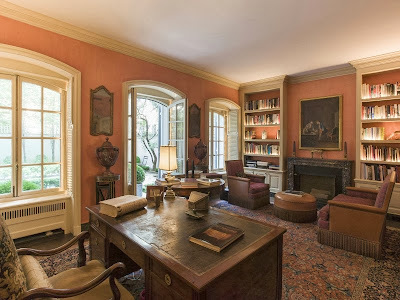 Completed in 1966 for the philanthropist, art collector and banking heir Paul Mellon and his second wife, Rachel "Bunny" Lambert Mellon, a noted gardener and philanthropist in her own right, still alive at this writing at age 103, the French style townhouse was an instant landmark. It was their pied a terre in Manhattan, their main residence being a 4,000 acre estate in Upperville, Virginia where Mrs. Mellon still lives (to be featured in a future post). 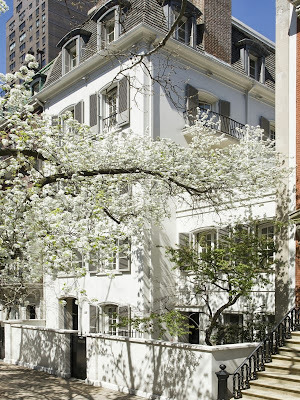 Architect H. Page Cross designed the house that replaced two typical late 19th-century brownstones. It was an usual project at the time when affluent families were relocating to the fashionable suburbs. "Storm" shutters were concealed within the thickness of the exterior walls, pulling down inside the coquina stone trim around the French doors and casement windows; a steel plate can automatically slide to block the front door to make it difficult to penetrate the urban fortress. offering by Sotheby's International Realty. One of the distinctive features is the wall along the sidewalk that creates a south-facing garden at the entrance, as seen in the first image. A second gate is the service entrance, originally tended by a concierge that also served as a security guard (with quarters marked Guest/Staff Bedroom on the plan). The scale and architectural detailing, along with the original decoration, is exceptional, providing the "quiet quality" that the Mellons desired. For example, that the wood floors are painted to resemble stone is an artistic statement rather than a budget compromise. the rear garden, as it appeared in 2013.
from a lattice covered vestibule. The cove lighting is not illuminated. Treillage is used as an effective wallcovering to establish a mood, here as a transition to the rear garden. Lattice also currently covers some of the walls in the basement. retains its original painted fretwork decoration. What might appear to be a peculiar detail today was originally intended as a special consideration to show the Mellons' magnificent art collection to full advantage, but in an understated way seldom seen in new residential installations now. Note the absence of recessed spotlights or other specialty art lighting, for example. The lighted bookcases were added by the current owners. The lily pool was added by the current owners. The wide rear garden is an unusual treat in Manhattan. 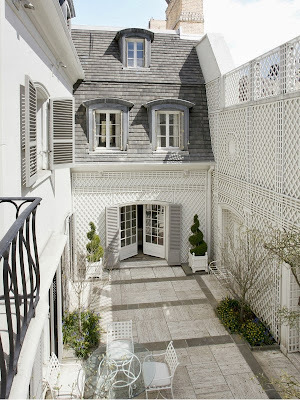 The Library, Drawing Room, and His Bedroom are among the rooms that benefit from the outdoor space. as it appears in 2013. 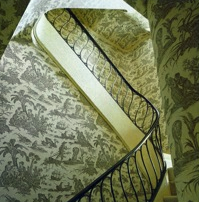 According to the November, 2013, issue of World of Interiors, the wrought iron stair balustrade of the main staircase was copied from a Jack Lemmon film. 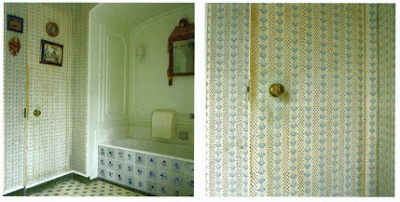 Four Bonnard paintings once hung on the walls now covered with toile de jouy. The Kitchen/Breakfast Room in 2013. The whole second floor was originally dedicated to service and staff areas. This floor appears to have been completely renovated by the current owners, making it more family-friendly. The Third Floor is luxuriously devoted to two principal rooms and a large south-facing terrace. The Third Floor Gallery in 2013. 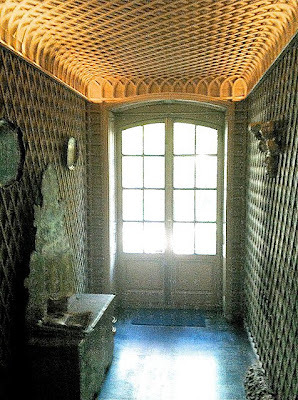 From the stairs or the elevator, when arriving at the Third Floor, one first enters an enchanting Gallery. 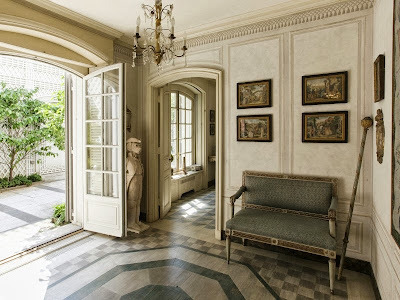 acting as an orienting space before entering the Drawing Room, Terrace or anteroom to the Dining Room. The wood floor painted as faux marbre is exceptional as are the walls painted as trompe l'oeil boiserie. 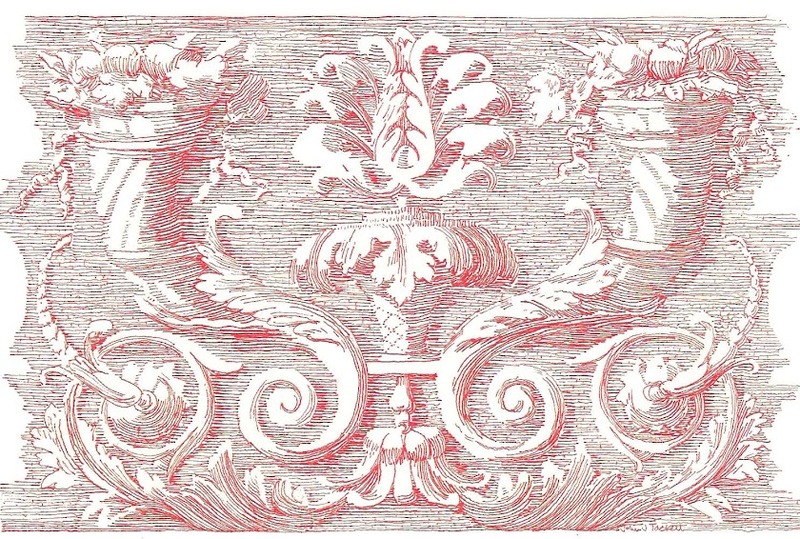 Note the frieze of tassels painted below the cornice. The Drawing Room overlooks the rear garden to the north and the Terrace with the Gallery seen on the right in the photo above. 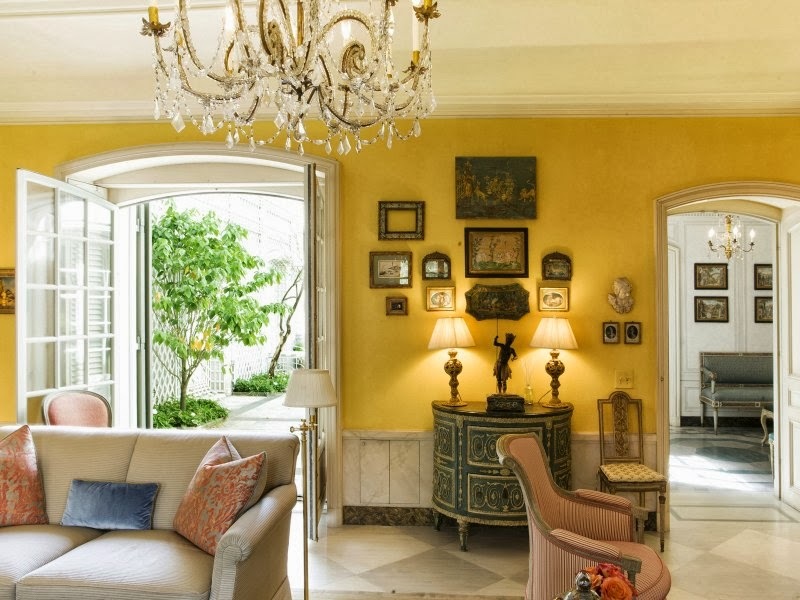 Although the original decoration was done in consultation with legendary designer John Fowler of Colefax and Fowler, many Devoted Readers will know that Fowler never visited the United States. Instead, the Mellons sent painters Paul Leonard and William Strom to London for two weeks of training, the magazine article states, and the decorating was carried out by mail. Although the yellow walls of the Drawing Room are an homage to Nancy Lancaster's famous room at 22 Avery Row, the glazed walls as they appear here were done as specified by the current owners, the article also says. A long list of decorators had a hand in the designs for the Mellons over the years with the last being Bruce Budd. 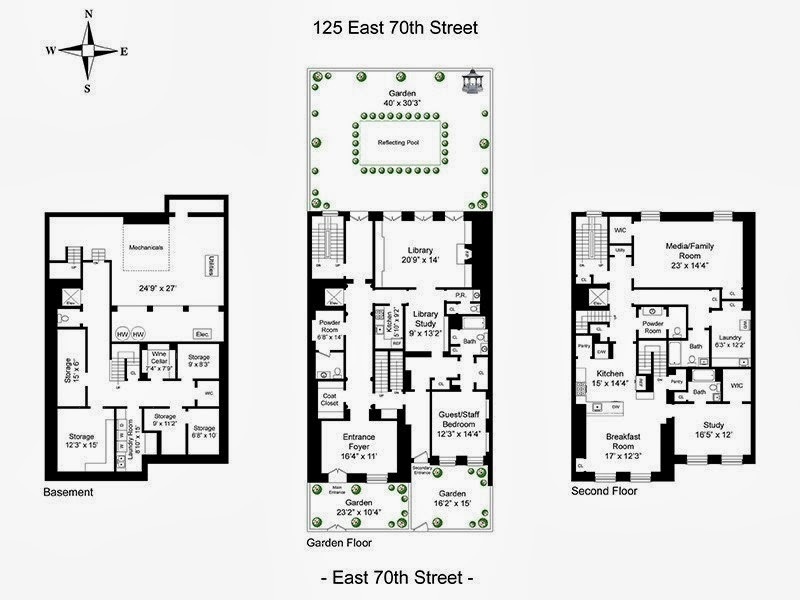 (Some might object that the townhouse lacks one critical amenity, a garage. This was not really a problem for the Mellons who owned a handsome old limestone-fronted carriage house nearby that had the capacity for 12 cars. Budd had a chic apartment above, making him available for decorating consultation as needed. Designed by architect C.P.H. 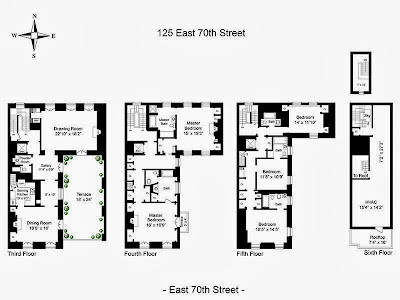 Gilbert, the East 70th Street carriage house sold for $13.5 in 2009; read more about it here). 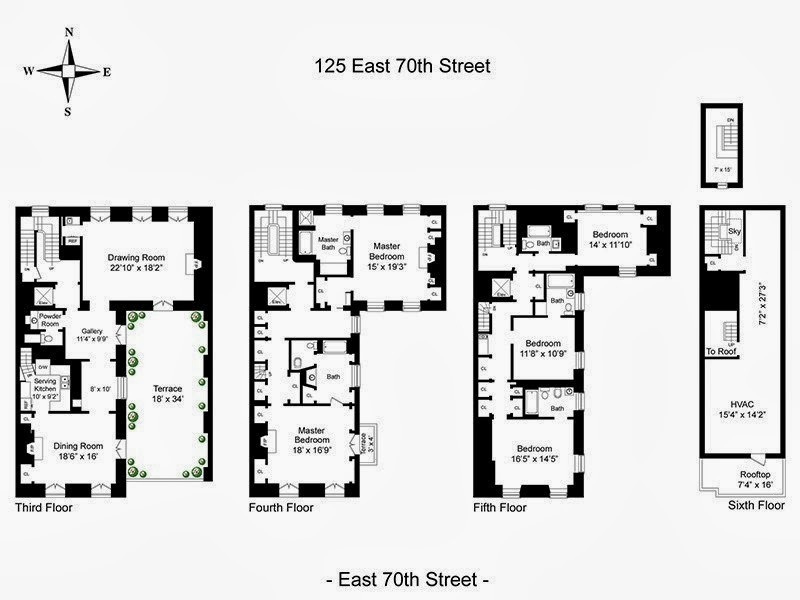 at 125 East 70th Street in 2013. 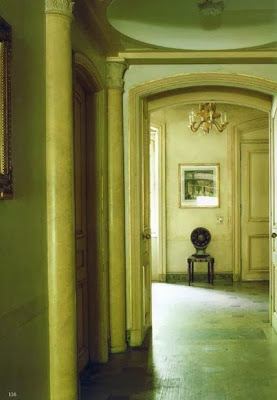 One of the most charming of these wood floors painted by Paul Leonard is in the Anteroom leading into the Dining Room. Note that the pattern follows the joints of the planks in the length with scored lines across the width to give the effect of tiles. 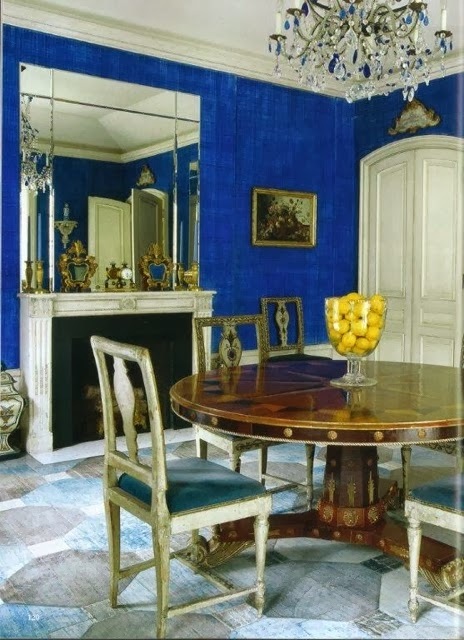 It is an excellent example of appropriate scale, pattern and color to link the adjacent Gallery and Dining Room. The Dining Room as it appears in 2013. 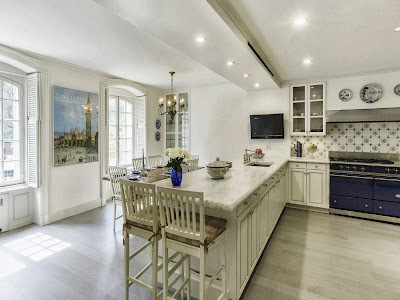 When the real estate photos of the townhouse starting appearing in the blogs a few weeks ago, there was speculation about many things, especially the walls and floor of the Dining Room. 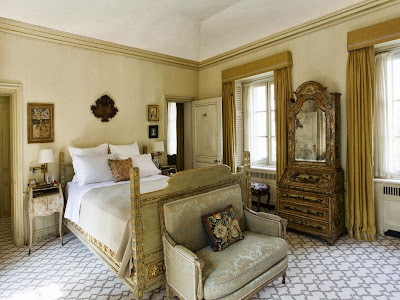 Being somewhat familiar with the house and the contributions of Colefax & Fowler and Paul Leonard, The Devoted Classicist offered some factual information, only to later receive notice that speculators thoroughly disputed my comments on the other blogs; so much for trying to educate the "experts." 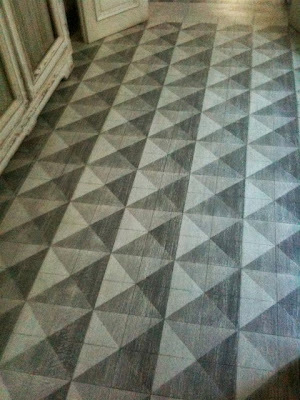 In any case, the floor is indeed painted to resemble marble as is the baseboard and dado (difficult to see in this photo). The walls are painted with a blue cross-hatched glaze that was formulated to compliment the major painting by Homer that the Mellons owned. 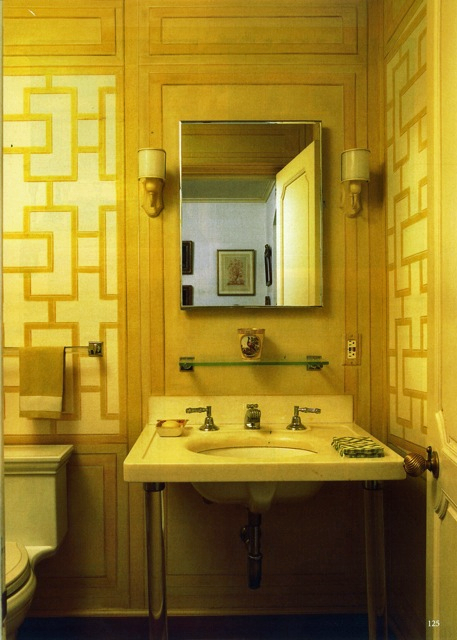 Legendary decorator Billy Baldwin added the sheets of beveled mirrors. An adjacent pantry acts as a serving kitchen and a small staircase gives access to the main kitchen below. of the Mellon-White townhouse in 2013. 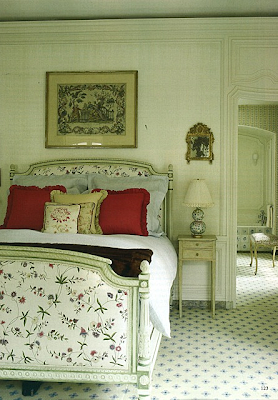 There are two Master Bedrooms on the Fourth Floor with the front assumed to have been used by Mrs. Mellon. The walls are lined with painted wood paneling in the transitional Louis XV/XVI style and the floor has a Colefax & Fowler carpet, a replacement of the same during the Mellon occupancy according to the article. An east-facing balcony overlooks the terrace below with the lattice on the common wall extending to filter the view beyond. Third Floor Terrace of 125 E 70th Street. Fortunately, the current owners kept many of the bathrooms intact. This, assumed to have been Mrs. Mellon's, is exceedingly charming. Of special note are the antique Delft tiles facing the bathtub. The walls, including concealed doors, are covered with printed fabric especially hand-blocked in Wales for Colefax & Fowler, according to the WoI article. at 125 East 70th Street. 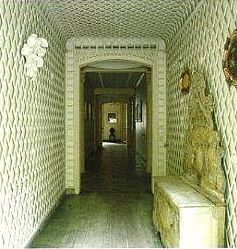 The bedroom on the rear of the Fourth Floor, then, was assumed to have been used by Mr. Mellon. It is a handsome space with a coved ceiling and a fireplace (not shown) opposite the bed. of the Mellon-White townhouse, 2013. 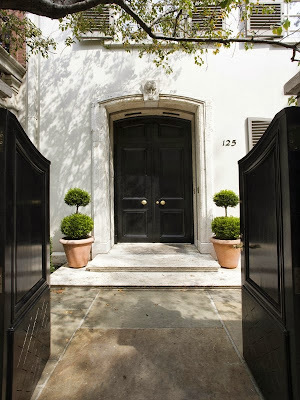 ﻿According to various on-line reports, Stribling & Associates listed the Mellons' townhouse for sale for $26.5 million in August 2005 and it sold early in 2006 for $24.5 million or $22.5 million with reports varying. The buyers were Clare and Tony White. 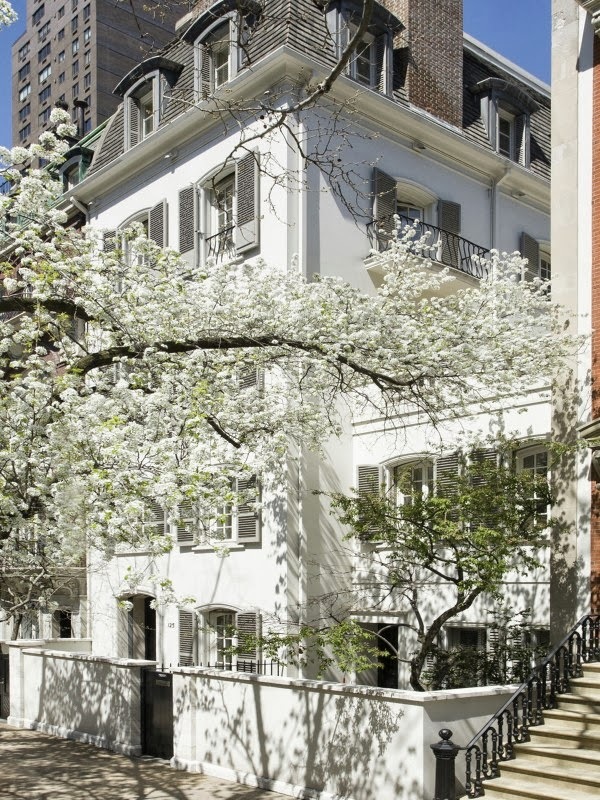 The Whites had bought their townhouse across the street at 118 East 70th Street in 1998 for $6.05 million and sold it in 2006 for $25.6 million to actor/director Woody Allen. Mr. White is an Irish businessman who founded Abacus Direct, a consumer data company that he sold for $1.7 billion. 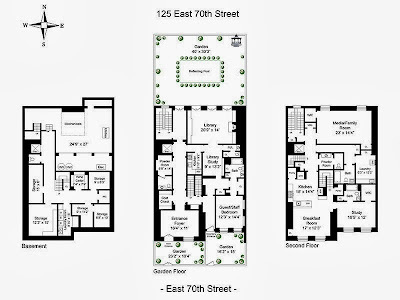 The Whites hope to repeat their success in real estate by selling their present home at 125 East 70th Street for $46 million. The listing through Sotheby's International Realty, including more photos and a video, may be viewed here.